Employing staff isn’t always about allocating tasks and setting deadlines. Sometimes it’s about managing personalities. As many small business owners can attest, those personalities don’t always get along. Resolving problems when employees are in conflict takes a skilful people manager who knows how to approach such situations with an open mind. Empathy is required to dissolve conflict because it is usually a product of miscommunication, misunderstanding, or fear. So, what can you do about employee disputes? If employees are disrupting the productivity of the workplace, this needs to stop. As the employer, it’s your job to make sure the conflict does not escalate out of control, interfering with other employees and causing other problems for your business. Also be wary, toxic employee relationships can be contagious. Stress spreads stress; and this can be detrimental to the culture of your workplace. Remain conscious and keep an eye out for disputes whether they are big or small. When employees are feuding, employers need to fact-find. What was the dispute in relation to? Was it to do with workload or a particular work project? Getting to the bottom of the dispute can highlight immediately what needs to change in order to reach a satisfactory resolution. It is important to provide equal an opportunity to each employee involved, and provide opportunity for them to explain their view. Ensure that you invite each party to a meeting where they have an opportunity to recount the situation. While initiating such difficult conversations can be tricky and confronting, honesty is the first step towards resolving the issue. Compromising and learning the reasons behind each person’s views can clear the air between the employees and help mend the relationship. Poor relations between employees can fester, with the potential to have a detrimental impact on the business, as well as the physical and mental welfare of all employees. Starting this process early is an important step in making sure matters do not deteriorate beyond the point of repair. Ask any witnesses to come forward. If the dispute involved significant wrong doing, or if the dispute involved a breach of the employment agreement or business policy, this is serious and could result in dismissal. Witnesses can help to add to the details of the dispute and, if required, build a case to support the dismissal. See these guides on dismissal and termination for more information. Document every detail. Employers need to fill out an incident/accident report for any wrong doings. By putting the specifics of the dispute in writing, employers can support their actions and submit this as evidence if the need arises. In addition, should a dispute happen again or if the dispute is legally escalated, the employer will have supporting evidence to draw back on. Offer the feuding employees some development coaching – they will appreciate the investment you are making in them and hopefully the returns will be worth it to you and your business. The bonus is that the coaching will relieve you of all that time and energy you are spending to prevent future disputes. Get immediate advice from external and impartial HR experts such as an Employsure Consultant to help you avoid disputes escalating into bullying claims in your business. 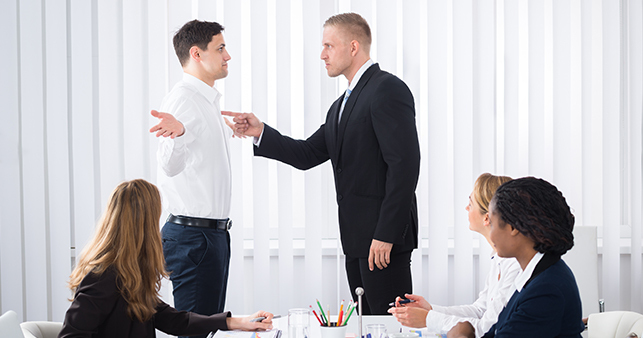 Experts will guide you to handle employee conflict and resolve employee complaints. If you can’t settle things between your feuding employees, ask Employsure for viable solutions. In order to manage disputes in the workplace, every employer should show their commitment to policies and procedures in each and every incident. By doing so you can ensure your team dedicates themselves to meeting the expectations of your business, free from the stress of workplace conflict. Good people, great business: treat employees like customers.